Here are ten great Christian bucket list items for you to consider in your life. What is a bucket list? It’s a list of things that a person desires to do in this life and becomes more and more important with each passing day. For me, I have a few things that I’d still love to do in this life before I pass into the next. Some of those things that I really want to do, I won’t be able to put into my bucket list, like going to Africa or India for a missionary trip. That’s not going to happen for me unless God opens a door, but there are other things that I’d love to do but won’t be able to do because I’m well into my 60’s, plus finances wouldn’t allow me to do that nor would my health, but there are other things within my range that I can and have done that were in my bucket list of things to do that I’ve already done. What about you? 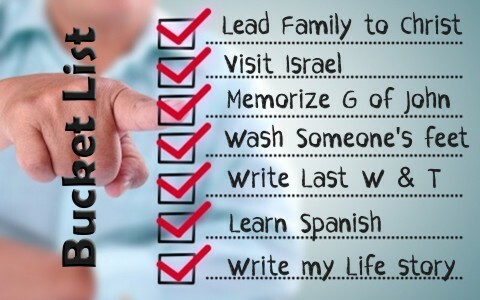 Do you have such a list? God can use us as a means to save others, even though God alone is the One Who saves (Eph 2:8-9), but that doesn’t mean we shouldn’t try. We cannot save anyone…but we can point them to the Son of God in the hopes that they might see their sinful state and be brought to repentance and to put their trust in Christ. I have so many family members who say they believe, but so do the demons, and that doesn’t mean they’re saved (James 2:19). Many will say Lord, Lord, someday but will be turned away by Christ (Matt 7:21-23). To believe means to be obeying and living lives of holiness (not sinless-ness), so at the very top of my bucket list is bringing family members to saving faith in Christ. What is more important in this life than that? would be one of the greatest joys of my life here on this earth. Our church has a member who has memorized the entire Book of Romans. When we are studying something that pertains to this book, many of us will look at Jack to see if he knows the chapter and verse, and he usually does. How does a person memorize an entire book in the Bible? By spending lots of time reading it. It didn’t come easy for Jack and neither will it to us, but to memorize an entire book of the Bible is one of those things I’m presently working on (and it’s the Gospel of John, my favorite Gospel). Our church has a prison ministry, but our church elder said something very profound. He said that those who are living in nursing homes are also prisoners…they are prisoners of their own bodies, and try as they might to get back home, they probably never will. This was on my list for a long time because of what James wrote in describing what “pure religion” is. He wrote, “Religion that is pure and undefiled before God, the Father, is this: to visit orphans and widows in their affliction, and to keep oneself unstained from the world” (James 1:27). Want to know more about what pure religion is? Just read what Jesus said in Matthew 25:34-30 and you’ll find plenty for your own bucket list. I would love to volunteer more of my time working in a children’s hospital and in an intensive care unit at a hospital. I would also like to work with Hospice, because as a pastor, I’ve been in some situations where I had the last chance to speak to someone about Christ before they passed away. I’ll never know in this life whether they trusted in Christ, but in a few cases, they did. What joy to lead someone to saving faith when they’re in a life-threatening situation? This is truly a remarkable thing that Jesus did for the disciples as He washed their feet, and even the feet of His betrayer, Judas. Our church does foot washing once a year and I believe you’d be humbled and humble those whose feet you wash. Jesus said, “If I then, your Lord and Teacher, have washed your feet, you also ought to wash one another’s feet. For I have given you an example, that you also should do just as I have done to you” (John 13:14-15). Everyone who has a spouse and/or children needs to make a will. It might not seem to be fun putting this into a bucket list but it’s very important, and the importance of having a will is not fully recognized until the person has passed away and everything heads to probate court to decide who gets what and what the state keeps. A will protects your family from going through this difficult process, so making a will was in my bucket list, and I say “was” because I’ve got it done. What about you? When you get older, perhaps you can start putting together an account of your life that your children and grandchildren can read after you’re gone. This is so much value in a person’s life, like the lessons they’ve learned the hard way, the importance of family, and what struggles they faced in life. A person who writes down their life story can pass this family heritage to their own children and grandchildren. This story becomes priceless once a person’s passed away, so why not record the story of your life and your family’s history (that you know of) because it will have great meaning someday. This is one that I’ve been working on for some years now. Now, I can speak Spanish, even if it’s like a 9-year-old, but at least I can communicate with someone who speaks a different language. Why would I put this in my bucket list? It’s because I love to get to know people of a different language so that I’ll know how to communicate the gospel to them in their own tongue. That’s as thrilling as it gets for me. I guess I was a late bloomer, unlike my daughter, because she went directly from high school to college. I waited…and waited…until I was thirty. By then, it seemed a bit harder, but I have no regrets now. Why not go back to school; perhaps to get your GED (high school degree), or get an Associate’s Degree at a junior college or get a college degree. Maybe you can even take a class for something that you love like history or music at a nearby college. It sounds hard, but once you get into it, you’ll never regret it. I have completed this some time ago now, and today, there is not one bit of regret, however, for some, they have had regret for not going to college or going back to complete their college degree. I hope my bucket list didn’t disappoint you, but a Christian’s bucket list should not be like that of the world. I could have included sky diving, scuba diving, climbing a mountain, or any other number of things, but a bucket list for Christians is often radically different from that of the world. We value a relationship with Jesus Christ as of supreme importance or doing things we’ve never done before. Saving a soul is infinitely greater than climbing a mountain. That’s because we place God over things we want to do, but when our bucket list lines up with the will of God, then you’ve got a great bucket list. Previous post: What Does The Bible Say About Piercings?